What Does Impassable Really Mean? 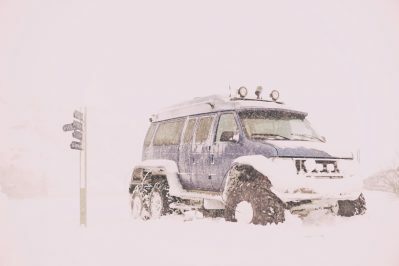 After the first snowfall of the fall/winter an F-road or mountain roads in Iceland can be marked impassable due to snow. This means that from when it is marked impassable until summer it won’t be monitored and people go there at their own risk. Only very large modified 4X4’s with very experienced drivers are taking on these roads at this time and even they can get stuck. Rental cars in Iceland are NOT covered by insurance when driving on impassable roads. A road that is marked as impassable is not likely to be marked as open again until summer with the exception of a few roads. Closed roads mean that driving there is illegal in Iceland. Highland roads are usually changed from impassable to closed in spring to protect the sensitive vegetation after the snow has melted. They are then opened in summer with the date changing from year to year based on conditions. To summarize: Impassable roads are challenging for even the most experienced drivers with large modified 4X4’s. No rental cars allowed – if you drive a rental car on an impassable road your insurance is void.